PGF Caravan Services provide a wide range of services for caravans, from caravan chassis repair to installation of motor movers. Our team are professional and friendly, giving you the confidence you need when it comes to the care of your caravan. Whether your caravan has broken down at home or on a site, we are there to help. Our mobile repair service allows us to reach you wherever you are and help repair or replace parts that you are in need of. We are dedicated and committed members of the Mobile Caravan Engineers Association (MCEA), one of the largest networks of caravan engineers. The prices that we offer are always competitive and affordable, keeping you in pocket and your caravan in top working order. Despite being out of sight, you should always keep an eye on the chassis. This piece of the caravan provides vital support for the structure and acts as the foundation for all the weight above it. It also provides the main tow hitch, enabling you to pull the vehicle, as well as suspension mounting points. There are some familiar phrases associated with the chassis of a caravan, and knowing these can give you a greater insight into the make up of the crucial structure. RHS (Rectangular Hollow Section) is a form of steel which is hollow and rectangular in shape. Sometimes known as cold formed rectangular hollow, this material is commonly used in the construction of the chassis. The process of hot-dipped galvanising occurs when iron, steel or aluminium is coated with a thin layer of zinc, creating a protective outer layer. DuraGal refers to a process where RHS steel is hot-dipped galvanised but the external zinc has a surface coating applied. This improves resistance to rusting and the adhesion of paint or other coatings. SupaGal is similar to DuraGal, however the RHS is coated on both the inside and outside of the steel. This makes it more expensive but prevents corrosion occurring from the inside. No matter what your chassis is made of, it is important to keep an eye on it. AL-KO, a large manufacturer or chassis’, recommend that these are washed using a pressure washer annually to help prevent the build-up of salt and dirt. If you notice a problem with your chassis, get in touch with our team today. We are always on hand to help repair damaged or broken chassis’. You can call 01452 553 288 today for more information. Developing damp within a caravan is the nightmare of all owners. Smelling a strange musty smell or noticing black spots can be worrying. Older wooden style caravans are more at risk of the development of damp, but it is worth checking newer models. As well as impacting the atmosphere of your caravan, damp can create serious health risks. Some of the most common health impacts related to damp and mould include allergic reactions, asthma attacks, compromised immune systems, lung infections, reduced mental health, memory loss, mood swings, and a negative impact on skin conditions such as eczema and hives. 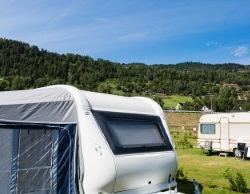 We offer damp inspections to ensure that your caravan isn’t developing the problematic issue. There are some signs you can look for to help catch damp before it becomes difficult to manage. Noticing a musty smell when entering your caravan is a sure sign that there is some damp somewhere. Black marks around windows and doors are another indication, as are staining on the walls, soft walls, and damp-looking patches. Some things you can do to help reduce the risk of damp include wiping down walls, airing the caravan, using moisture traps, and limiting condensation within the caravan. It is hugely important to have an annual service carried out on your caravan to help you keep on top of any developing problems and improve the longevity of the vehicle. The Caravan & Motorhome Club recommends that a service is carried out annually to guarantee the safety of the caravan. A basic caravan service usually includes inspections of the chassis and running gear, electrical systems, gas systems, water systems, bodywork, ventilation, and fire and safety. Our skilled team can carry out repairs on a wide range of brands, including Bailey, Swift, Coachman, Lunar, and Rapido. The market town of Dursley has a population of around 7,000 and once had a castle built by Roger de Berkeley in 1153. While in the area, there are plenty of things for all the family to do. You can visit the Cam and Dursley Community Cinema, popular pub the Old Spot Inn, or the Stinchcombe Hill Golf Club. If you are in need of caravan repairs or services including chassis repair, please do not hesitate to get in touch. Our team are always on hand for customers in the Dursley area, whether at home or on holiday. Taking care of your caravan is important and it helps to have a professional and trustworthy service on your side. With PGF Caravan Services you can be sure that any work carried out will be conducted to the highest of standards. You can call today on 01452 553 288 or fill in our online contact form to book in for a service or repair with us.